Traffic Monsoon, Taking Low Quality Traffic to New Heights. One of the biggest hurdles for newcomers to the online world is their ability to get “traffic” to their website, because without it no level of success is possible. Traffic Monsoon is an up and coming traffic exchange and PTC (Paid To Click) site that offers you the ability to earn revenue/credits by clicking on ads and depending on whether or not you purchase their “services”, you can earn more credits within the platform. There are many problems however with the quality of the traffic and the underlying business model that this program institutes to run their business. There are also many complaints about this program online, something that I can only see continuing as time goes on and more people spend money (and their time) within Traffic Monsoon, with very little results. The 4 Headed Earning Opportunity. There are 4 ways in which you can earn revenue through the Traffic Monsoon scheme, listed on their website. I a going to uncover these and help you better understand exactly what you will be doing to generate the revenue. Paid to Click (PTC). Exactly how it sounds, you are going to be clicking on people’s websites through the “cash links” an you will earn revenue based on how many sites you click. By clicking on a minimum of 10 ads in a day, you will qualify to receive a share in revenues from generated sales and services.Paying advertisers are often times on the other side of every click, meaning people are paying for this “disengaged” traffic (you) on the other end. Using ad services (buying traffic) to generate revenue to your business. 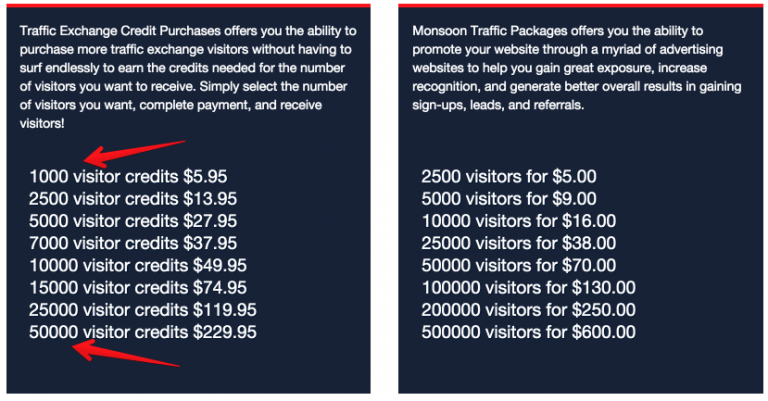 This is one of the promoted “ideas” as to how you can earn income through the Traffic Monsoon platform, basically you can buy ad packages/plans where you pay money for traffic. These range from 1,000 visitor credits for $5.95, all the way up to 50,000 visitor credits for $229.95. You can also purchase traffic packages directly through their “myriad” of advertising websites, with the top package being 500,000 clicks for $600. The problem is that the very traffic won’t generate leads or quality traffic to your website. Instead, it is being mostly driven from people that are part of the traffic exchange itself. They are clicking on your website to earn “credits”, not to buy something. Revenue sharing. You can earn revenue by recommending people into your downline at Traffic Monsoon through their referral program. The more referrals and the more active your referrals are in terms of their “clicking”, the more potential revenue you can earn .This income is not guaranteed as your referrals have to “click” and do so in high volume in order for you to generate revenue. The estimated monthly income if you refer 10 people to Traffic Monsoon and they fulfill their clicking duties for 30 consecutive days is $30. Direct sales commissions. You will receive 10% of your referrals purchases from the ad plans. If someone buys a $229.95 plan, you will get 10% commissions on that, or $23.00. This does not include cash link purchases as that money is divided up between the clickers and the sponsor of the clickers. As a member of Traffic Monsoon, one of your core focuses as a user is going to be clicking on other people’s websites. In exchange, depending on how you are situated within the program (paying versus non paying) you can earn a nominal amount of revenue for doing this, or you can earn “credits” which can then be used to generate clicks back to websites that you own. Then, on the other side, you have people “paying” for ad packages where they are actually paying for your traffic hoping to generate leads and sales as a result. This reminds me very eerily of joke company that was put out several years back when I was in college, we used to laugh about it. It was called “Click Monkeys” and at the time it was hilarious (if you want a laugh you can check out their site here). Fast forward 15 years later and the click monkey idea has become a BUSINESS model…well, if you want to call it that. Except now, YOU have become the monkey. In exchange for your time and mindless clicking, you have the potential to earn mindless clicks back to your websites…and in some cases, revenue. Hosting companies do not love traffic exchanges and there is very good reason for this. Low quality traffic starts to hammer their servers when companies like Traffic Monsoon start sending PTC traffic to their websites. This creates load issues and it can actually bog down an individuals website to the point where it ends up going offline. So if you do ever decide to send a mass amount of PTC traffic to your site and you are on a shared or managed web host (one in which you are on a server with other clients), you stand a very good chance of getting your website shut down when these load levels spike. You might be required to purchase more expensive hosting plans moving forward or have your hosting account deleted altogether (as many hosts do). Is it a Viable Way to Create a Real Business? Many people are making money from Traffic Monsoon. The reason being, they are getting other people to join Traffic Monsoon and there is enough people out there that are so desperate for “web traffic” that are unwilling to work for it, they feel they can just throw spaghetti at the “traffic exchange” wall and buy an ad plan and reap the rewards. There are also lots of people building a business off of recruiting others in to this ad exchange or selling ad packages to others (or both). The bulk of all income within programs like this is derived out of those buying traffic and ad packages within the program. It reminds of a very similar program, Banners Broker, that was ultimately shut down by authorities (and the owners were actually arrested). More on this later. When you are performing these tasks you are not thinking about the content on the other end of your click transaction Rather, you are just trying to perform the mindless clicks so you can earn some revenue or earn some “credits’ so you can earn some traffic in return for your efforts. Traffic Monsoon Creating Their Own Bank? There was significant news surrounding Traffic Monsoon that they were moving away from using Paypal and were going to set up their own bank in Dubai. Charles Scoville has claimed an extraordinary amount of income and that they are losing out on $29MM alone to Paypal fees, but the reality is that many merchants like Paypal do NOT allow MLM companies to use their services. They are high risk clients and it is only those merchants that are willing to take considerable risks that take on schemes of this nature. For good reason it seems as Traffic Monsoon has since been shut down since this announcement. Just in the most recent year, one of the longest standing traffic/banner exchanges has been taken down, that being Banners Broker. The owners of that program were arrested in Canada and were also forced to seize all of their assets. You can read about that story here. The problem here is that the foundational business model of Banners Broker is actually quite similar to that of Traffic Monsoon, without the ties being pyramid (which it is highly debated that Traffic Monsoon is not). My final thoughts on whether you should use Traffic Monsoon or Not. I wouldn’t declare Traffic Monsoon a scam, but it has been put under immediate investigation by the Securities and Exchange Commission. The assets of Traffic Monsoon have been frozen, meaning anyone involved in the program is temporarily out of any expenditures they have set forth…potentially forever. My recommendation is to always take the high road when building a business online and to do so in an ethical way. If you are making money at the demise of others or selling/taking part in a service only on the premise that you will make money from it, you might want to reconsider your reasons for choosing a specific business. Those that were involved in Traffic Monsoon were gravely warned by others outside the “bubble” that it could all come crashing down and as it stands, the SEC is going to make sure this happens. Do you have experience with Traffic Monsoon either through their PTC/Refferal network or have you purchased ad plans/packages in the past and you would like to share your experience? If so, please leave your comments or questions below and I will be more than happy to get back to you. I would love to hear your feedback. Tired of Scams? Read about my #1 Ranked Product Here! I worked Traffic Monsoon for months and then it just disappeared. Glad to know what happened to it. Remember the guy (Todd I think) that was the front face? I was surfing this morning and he is at it again promoting another company. I do not remember what it is. This is typically the case. People involved in such schemes jump from one program to the next. When one program starts to receive “heat” or worse yet, the FTC is investigating it, then they quickly move on to the next program. The often times will bring their following with them and yes, subject them to another very similar scheme or scam. The best thing you can do is to avoid ANYONE that effectively has pushed programs in the past that have been taken out by the FTC. It is representative of how they operate in the business world and their unethical behaviour almost certain is going to continue. Some people definitely do have a better gauge as to what is a legitimate program versus something that is about to take advantage of them and it is very fortunate that you didn’t fall for this one as a lot of people have lost a lot of money through this program. Security Exchange Commission. They regulate and enforce the US legal platform surrounding securities, trading and similar types of business. They are responsible for some of the biggest take downs of ponzi schemes over the years (including Madoff). The FTC is actively involved in programs that present themselves as pyramid schemes as well, they are both diligently working to protect the consumer as well as the investor. I love the concept of earning credits to earn traffic. Its brilliant. I have a question, will this work on a brand new website with little to no traffic at all? Just wondering for my WA because I just got it indexed and i am thinking about using this website to help with the traffic. Keep up the good work, I like the website a lot. The concept in theory is cool, the only problem is the traffic you will get is totally disengaged and will not convert. It will be other people like yourself that is sitting there clicking on links in effort to earn credits themselves, they are not actually interested in the content in which they are clicking. There are ways to get REAL targeted traffic online. SEO is good starting point, PPC is a good starting point, Social traffic can also be a good starting point. Avoid paid to click sites though, they will waste a considerable amount of your time with little to no return. Any idea what the payout per ad click is? I know Clixsense’s maximum pay per click is 1 cent…and I haven’t found a single PTC company that pays any better. The payout per click is $0 now, as they are in receivership. And the reason they are in receivership is the fact that they weren’t paying out owed money to people even though they were using rakes and shovels to stash away cash they were earning from the scheme. If you are going to create a business online, avoid PTC programs. If you want quality traffic, avoid PTC schemes altogether. It is a gaping rabbit hole. I have heard of Traffic Monsoon before, they are good at advertising how good their traffic exchange is and the PTC, however, I am not interested to know since I have found other free ways to get high quality traffic better. I also like what you teach to get traffics. Even if I were to choose to buy traffic, I would choose solo ads from reliable sellers. Thank you for warning us about Traffic Monsoon, I will stay further way from them now. That is the thing, there are many ways to get high quality traffic online. Other than it being easy to click for clicks, there is very little benefit to doing this. The quality of traffic you are getting in return is essentially bogus and your efforts are simply adding to the “pool’ of ad packs that the founder was selling and it appears generating a ton of revenue doing so. If you want to create a long term and successful business, you should focus on building a business. Avoid joining schemes of this nature, they are temporary fixes and your income is not built of a solid foundation. If a business model is flawed, it’s going to collapse eventually. It doesn’t matter whether it’s in the online or offline world. Same old principles still apply. We must always provide value in what we do. I believe Traffic Monsoon is not going the be the last of its kind.There are also sites where you actually can buy “likes” or “followers” for your social media account. I think these sites will follow the fate of Traffic Monsoon as well. That is very sound logic, the word “eventually” could definitely mean anything though. Sometimes schemes and flawed business models take 10+ years to extinguish, other times it happens within a few years. It tends to happen much quicker when people are getting ripped off or losing large sums of money, or in the case of Traffic Monsoon, not getting paid out owed commissions as per many complaints online. It isn’t the last of it’s kind, there are many other spin offs out there already…some from past members of this scheme. There are also many other programs that are existing in this space that just haven’t gotten “caught” yet, but rest assure with time they WILL. Traffic Exchanges oh my… A relic from the Wild West internet marking days of the 1990s. We have come a long way! There were so many scams back then you could throw a rock over your shoulder and hit one. Anything for “traffic” at all costs. Thanks goodness we are (at least a little bit) smarter today. Thanks for posting! Just when you think we have come a long ways in terms of an ethical internet and one that is not so wild west, we have the proliferation of traffic exchanges, of recycled solo ad platforms, and substance free MLM’s that are charging $10,000’s for the opportunity to promote the same program to others. I am not sure things are much better these days than when they were in the 90’s, but I do hold out hope. I hope we continue to evolve towards a much more ethical Internet, but as long as people continued to get suckered into schemes, there are going to be people building these schemes. Really interesting article – traffic monsoon, very interesting opportunity. i’ve never heard of it before. Thanks for the informative article because I see that there may some problems with this product when looking at the reviews. I’m a fan of the other platform you offer down at the bottom though! Yeah, a lot of people haven’t heard of it but a lot of people have and they are quite interested in seeing how this rolls out. Lots of people are owed lots of money and those can only hope that the founder hasn’t squandered this money away and they will be able to recoup all of their Traffic Monsoon investments. What and eye opener. I’ve seen Traffic Monsoon advertise a lot… I never came around to really check it out. I have seen some programs where you also have to click on different links to get credits for traffic. I don’t remember exactly the name, but it’s going around. It’s a shame that scrupulousness people take advantage of the majority of us trying to improve our lives by exploring the internet and the different options to Make Money Online. Thank you Kyle for writing such and extensive and deep review. I know it will save a lot of people, money, time and specially aggravation. Luckily we are part of WA where you two guys are so hones and really care bout our success. There are many Paid To Click (PTC) sites out there and they come in all sorts of shapes and sizes. Unfortunately, they draw people in because people become so desperate for traffic and they are not knowledgeable enough or willing to put forth the time and effort it takes to get high quality traffic, so they throw money at what appears to be “cheap” traffic. The result more often than not. Wasted money. In the case of Traffic Monsoon though, people were getting drawn into the program, becoming click monkeys and in a lot of cases working tirelessly to recruit others into the program and ultimately bank on them upgrading to certain ad packages. The end result, them losing out on all of their revenues when the SEC seized all of Traffic Monsoon assets, a state in which the company still exists. This was a very interesting article. I have never heard of traffic monsoon although I have been looking for ways to generate more traffic to my site. I will definitely not be trying traffic monsoon as I do value quality traffic with engage visitors. It is definitely beneficial to just focus on content rather than try and purchase clicks/views. You might never get the opportunity to try it out, in particular if they are convicted of being a pyramid/ponzi scheme by the SEC. I am sure there is going to be a lot more to the story as it continues to unfold but my hope at the end of the day is that all of the parties that were involved and lost money are compensated for their losses.